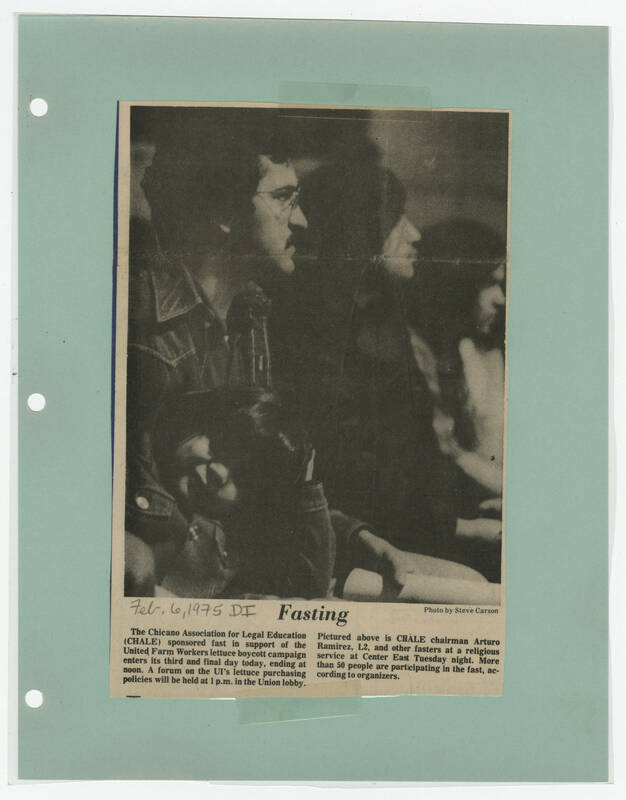 [[Photo caption]] Photo by Steve Carson [[Handwriting]] Feb. 6, 1975 DI [[Header]] Fasting [[Caption text]] The Chicano Association for Legal Education (CHALE) sponsored fast in support of the United Farm Workers lettuce boycott campaign enters its third and final day today, ending at noon. A forum on the UI's lettuce purchasing policies will be held at 1 p.m. in the Union lobby. Pictured above is CHALE chairman Arturo Ramirez, L2, and other fasters at a religious service at Center East Tuesday night. More than 50 people are participating in the fast according to organizers.